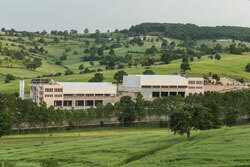 Yasamsal factory is located in a very beautiful surroundings in lush countryside, 75 km far from Istanbul, ideal place for livestock farming and for intensive organic crops, in other words an interesting production area. The owner of this unique amazing industrial area can rightly boast of what she has built and what they are doing: “ Our products are made according to organic production rules, we know the drill from the wheat choice to the packaging, we don’t miss a thing. We have chosen the organic production because is an appealing philosophy based on the conservation and fertility of the earth, aimed at feeding the plants by means of the biological activity of ground ecosystem”. To the question – How come did you choose Storci for your pasta production? – she answered: “Your Company was recommended by my nephew who lives in Italy, and that was a positive surprise. We had a series of specific requirements to be met and Storci helped us with it and thus we chose the OMNIA, that’s undoubtedly the best solution to produce several shapes, with a small footprint. The result is an excellent product, both qualitatively and esthetically, limiting predictable definitions referred to pasta, such as “not inviting, but tasty”. In this case we can only say” inviting and tasty”. The future? We would like to continue producing organic pasta , gluten-free also, to meet the needs of an increasingly growing market and I’m sure that this time too Storci will help us find the best solution.